Versailles FFA’s 10th place soil team consisted of Caleb Kaiser, Alex Kaiser, Dallas Hess and Jacob Wuebker. NEWARK – The Versailles FFA placed 10th overall in the state FFA soil judging competition on Oct. 13 at Dawes Natural Resources area in Newark. 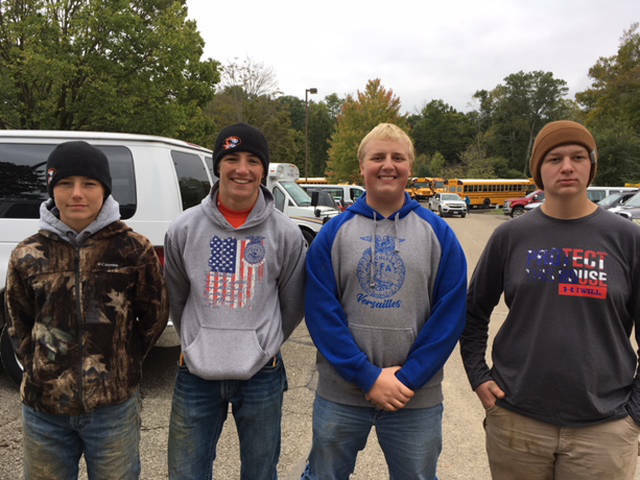 The Versailles FFA team members included Alex Kaiser, Caleb Kaiser, Jacob Wuebker and Dallas Hess. Out of more than 200 participants, Wuebker placed 14th overall.